Skyrunning pictures on Facebook have my heart racing, my eyes becoming dreamy. Click here to read about some of the most beautiful skyrunning races in the world. I am more than 100% sure that it’s going to be on my serious agenda very soon. For a large running community in India, looking to getting out of the city, embracing different terrains, mountain running etc…Skyrunning is just the thing that needs to be given a shot too! Somehow, we all want to take our passions to different places and bring back many beautiful memories running in surreal places far away from the maddening crowd! Last year, A runner from Delhi was covered by wellthyfit on her skyrunning experience. Read here! I requested the spunky mountain running girl, Nupur Singh – who organises Skyrunning events in India to tell us all about skyrunning, how different is it from ultra-running, what training it entails and how does her own organisation go about organising skyrunning events in India! What is Skyrunning? The concept and history. Skyrunning or you can say mountain running is a sport born in the wild, where the logic is to reach the highest peak in the shortest time from a town or village. It is defined by the Federation that was formed to govern the sport, the International Skyrunning Federation, as “running in the mountains above 2,000m altitude where the climbing difficulty does not exceed II° grade and the incline is over 30%”. The idea of creating skyrunning as a sports discipline, was the brainchild of Italian mountaineer Marino Giacometti. Today there are around 200 races worldwide with around 50,000 participants from 65 countries. Though in India, only few know about the concept and take part in. How is it different from trail running? Trail running is considered running on unpaved surface in any natural setting. You could run on a gravel path, or on a jeep track or on a beach trail and you’d be trail running. Whereas skyrunning combines mountaineering, and running and takes place exclusively in the mountains above 2000m. It is distinguished not so much by its distance but by its vertical gain and the altitude. Skyrunning, an adventurous alternative to those looking to challenge them. With almost every major city hosting dozens of running events every month, the thrill and excitement of taking part in such events is fading away. One is looking for new challenges and running a marathon is just not enough. Why only stick to road running and long distances, when you can explore so much more. Skyrunning is an option that will take your running to the next level. Along with the awe-inspiring and the majestic views of mountains, you can experience running on numerous terrains – gravel, rocks, boulders, mud, river crossings, snow and the ascents that will challenge you to the core. What kind of events happen in India? Events ‘The Hell Race’ organizes. The concept of skyrunning, even trail running for that matter is very new to India. There are only handful of trail running events take place like the Ultra India Race in Munnar, Paradise trails Goa, Run the Rann, Malnad Ultra, Kaveri Trail Marathon, Bhatti Lakes Ultra are few to name. The Hell Race, is a Himachal based endurance race series that organizes trail running and mountain biking events in the Himalayas; introduced the 1st edition of Skyrunning in Sept 2016. 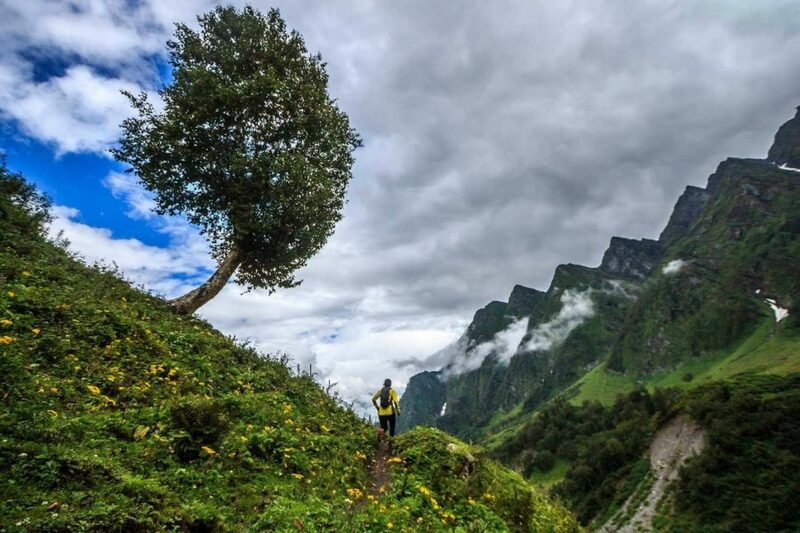 The race came out as a surprise to many, since it was their 1st encounter of running on pure Himalayan trails with lots of elevation gain, though the stunning views of Himalayas left them awestruck. The 2nd edition of the race is scheduled to happen on 1st October 2017. In the 2 categories 30km and 60km, the distance might seem easy, but one requires to climb 2100m and 4200m resp. over mountainous terrain. The route involves 80% trail and 20% Tarmac. It surely will be one hell of a race to remember. The Hell Race is also planning to organize few multi-day pure trail running expedition in 2018 in the Dhauladhar ranges of the Himalayas. What kind of training is required to compete in skyrunning? Learn to speed hike – it’s a technique to walk fast on steep climbs, so one can save energy for the race ahead. Train for long uphill’s – get used to long and very steep climbs. Learn to control your breathing while doing uphill. Train for downhill’s – climbing is important, but you should also do lots of downhill running to get use to the impact. Strength training – include lunges, planks, squats, pushup, etc. Learn to handle variation in terrain – run in different kind of terrain, soft ground, hard paved surface, easy terrain and technical terrain. The weather in mountains shifts dramatically, one must be able to run in varying weather conditions – rain, cold, sunny, etc. Stairs training – include at least 2-3 sessions per week. Speed is often not much of a help while running in the mountains; endurance, strength and will power is what that will matter! The writer of this article Nupur Singh is the Co-Founder of The Hell Race. Do check their page for some beautiful mountain runs coming up soon! The Hell Race is a small team of adventure enthusiasts working towards promoting endurance sports and adventure ethics in the country. They believe that the Himalayas have immense potential to host ultra-running and mountain biking events in a way that will appeal to everyone. In just two years of operations The Hell Race has become one of the leading players in endurance sports nationally.